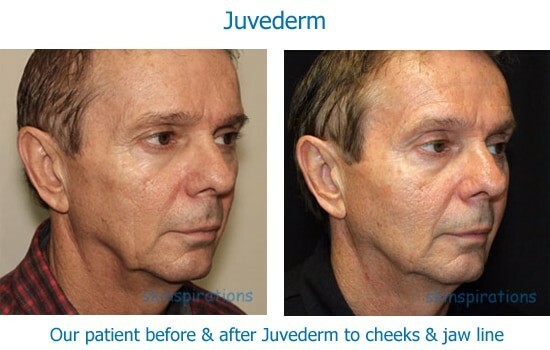 Juvederm® dermal fillers are the most popular dermal fillers in the world, providing immediate, natural looking volume replacement, lift, feature enhancement, and correction of wrinkles and depressed scars. With the multiple types of Juvederm now available, it's also the most versatile dermal filler available, with a version customized for every dermal filler need, including facial volume restoration, lifting of sagging tissues and brows, enhancement of lips, chins and cheeks, and the smoothing out of lines and wrinkles of every type. Dr. Elliott has taught advanced dermal filler techniques to many of the doctors performing cosmetic treatments in the Tampa Bay area. Dr. Elliott and the other practitioners at Skinspirations are some of the most experienced aesthetic injectors in Tampa Bay, and as proof, Dr. Elliott alone has performed over 10,000 dermal filler treatments since 2003. Because of her reputation for results, she was chosen in 2008 by Allergan, the company that produces Botox Cosmetic & Juvederm, to teach her techniques to other doctors & practitioners. As both a speaker and instructor for Allergan, Skinspirations is given access to Allergan's new dermal fillers and products months before they become available to other practices. When it comes to your face, would you rather have a student or the teacher? 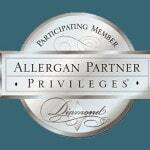 Skinspirations is honored to be awarded Allergan's Diamond Level status, which is reserved for practices in the top 1% of Allergan's accounts across the nation. This is even more meaningful because Skinspirations offers a choice of all the major dermal fillers & not just those made by Allergan. What are the Differences Among the Five Types of Juvéderm? All Juvéderm® products are made of non-particulate hyaluronic acid, which is a naturally-occurring sugar in human joints and skin that provides support and cushioning. To make the results last and provide support, the biodegradable hyaluronic acid in Juvéderm® is stabilized by cross-linking the molecules, & the XC versions have added anesthetic, making the treatments virtually painless. For your comfort, Skinspirations only uses the XC versions of all of their Juvéderm® products. Currently there are five types of Juvederm which are each designed for different purposes. The following Juvederm Vycross™ products all start with the letter "V", standing for Vycross™ cross-linking. The Vycross method produces gels whose results tend to last longer, lift better and, because they absorb less water, tend to cause less swelling. Juvederm Voluma® is a stiffer (yet soft to the touch) gel than Ultra & Ultra Plus, so it's excellent for lifting slightly sagging areas below the area it's injected, without adding too much volume. Because of these qualities, it works best when placed on top of bony areas like the cheekbones, jawline or brows. Voluma can be compared to using a center pole to lift a large tent. When the pole is placed on a hard surface, it can lift the entire tent. If it's placed in soft sand, it sinks.Softer fillers like Ultra or Ultra Plus are compressed downward by the overlying skin more than Voluma. When Voluma is used in areas without underlying bone, like the lower cheeks, it's at a disadvantage because it doesn't attract water. In non-bony areas, Ultra Plus adds volume because of this water attraction. 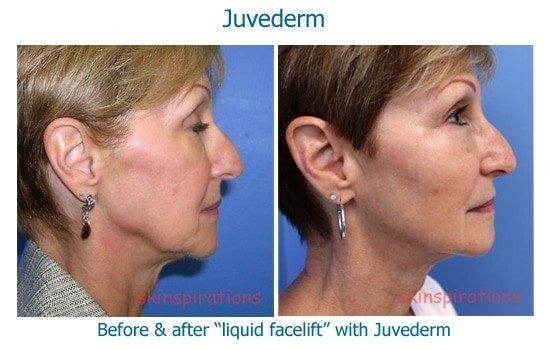 The improvement from a Juvederm Voluma lasts up to two years, on average. Juvederm Volbella® is the thinnest of the Vycross products and is therefore a good choice for areas that usually swell easily, like lips and under the eyes. The results of Volbella last about a year, which is months longer than other hyaluronic acid fillers developed for use in those areas. Juvederm Vollure® is the newest addition to the Juvederm family in the US, but has been used under the name Volift in Europe since 2013. it's a medium thickness filler used for areas like nasolabial folds, marionette lines, temples, and lips. Vollure's results usually last about eighteen months. What Is a Juvéderm XC™ Treatment Like? The treatment takes only minutes to perform and the results are immediate. 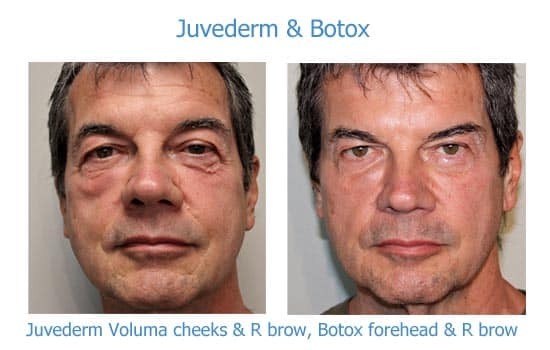 Juvéderm® is inserted through a tiny needle, and the improvement is immediate. There's usually very little swelling and many of our patients pop in during their lunch hour and then go right back to work. Because hyaluronic acid is naturally found in the body, there is little risk of an allergic reaction. Bruising can occur with any injection, so treatments should be scheduled when you don't have a social event coming up within the next few days. How long do the results of Juvederm treatments last? The duration of Juvederm filler results depends on the type of Juvederm used, the area where it's placed & whether the area has been treated before. Juvederm Ultra, even though it's the thinnest version, when placed in the lip lines or under the eyes, can last from one to two years, but in other areas, may last nine to twelve months. Ultra Plus results can be visible for an average of about twelve months. Vollure lasts about eighteen months and Voluma can last up to two years. With all injectable dermal fillers, the results from subsequent treatments tend to last longer than with the first, probably because of their collagen stimulating properties. See our gallery of before & after Juvederm photos. The price of dermal filler treatments reflects not only the cost of the product but the skill and experience of the injector, as well as the time the treatment takes to perform. Our providers are recognized as being among the top 1% in the nation for skill and experience and you'll find that we are competitively priced, despite being the most experienced in the area. Juvederm is priced by the syringe with a multiple syringe discount up to 25% when more than one syringe is used during a session. Prices start at $625 for the 1st syringe of Ultra or Ultra Plus, $399 for Volbella, $740 for Vollure, and $840 for Voluma. Call 727-571-1923 now for a free consultation to see how Juvéderm® treatments can help you achieve the look you've always wanted. Be sure to sign up for our monthly newsletter, full of what's new in cosmetic medicine, email-only promotions and invitations to our events.